This month the Creative Cuts and More Design Team is showcasing die cuts with a Patriotic/Picnic theme. The Blog Hop starts at the Die Cut Diva Blog, if you arrived at my blog first, you'll want to head back to the beginning to follow along with the hop to see what the other designers created. The images on the cover are stamped in Black Archival on watercolor paper then colored using the Marker Watercoloring Technique. The pattern paper and card stock were adhered to the Chipboard album pieces using a Glue Stick, sanding any rough edges. The Chipboard die cuts already have holes for the rings, so I covered one side at a time, used a Crop-a-Dile to punch the holes, covered the other side, and punched the holes again. 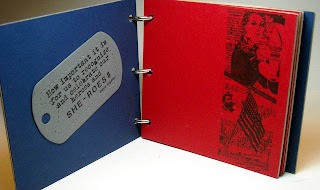 After I punched the first holes, I had a light bulb moment, and realized I could have left them covered and used my Bind It All to create a spiral bound book. Using a Quickie Glue Pen, I added some Rhinestones to the Star die cut. Thanks for stopping by, your next stop on the hop is Becky's Blog. Lisa, Brilliant use of dog tags and film strip! I so gotta make one of these!!! Thanks for the inspiration!!! I can't wait to see the inside! I love it Lisa! I love that filmstrip die! Ohhh this is perfect with the vintage stamps, and colors you used for the die cuts and album. WONDERFUL! TFS! OMG! I love this! You are very talented girl! Adorable project! Thanks for the inkspiration! What an awesome book you created! Love the die cuts on the cover of it. 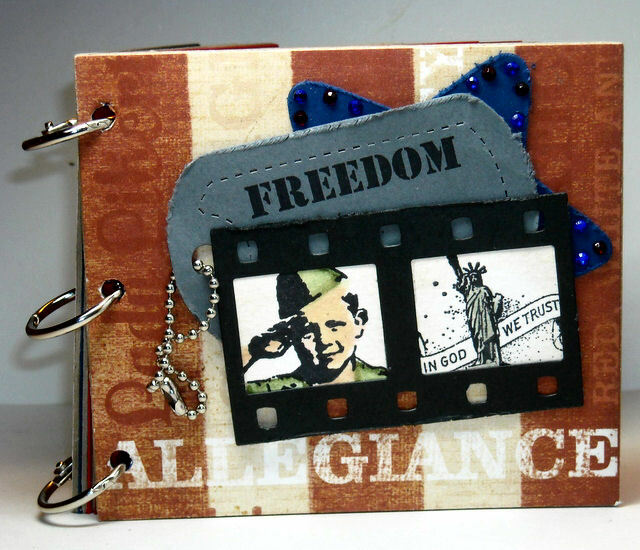 What an awesome looking album....the film strip and dog tags are perfect for this patriotic/military themed design!!!! This is great!! Love the film strip and the dog tags!! What a great red white and blue brag book! Happy Blog Hoppin'! Neat mini! I love how you layered the die cuts! Really lovely design! Beautiful details with the filmstrip and the tags. Lisa, Wonderful album! I love the filmstrip and the embellishments, so patriotic! The "light bulb moment" was priceless! Don't you love those - after the fact? So cool, what a great mini book!! Had to check out everything else on your blog, you are amazing!! Love your work!